Please note, Tuesday, October 3rd is the national holiday of Germany (�Day of German Unity�). Hence, most shops including grocery stores and supermarkets will be closed on that day. Accommodation will be arranged by the University of Leipzig for all invited speakers. An e-mail with detailed arrival and accommodation information will be sent to you approximately two weeks prior to your arrival. For information on German visa regulations, please see the website of the Federal Forein Office. "Kurzstrecken-Fahrkarte" (short distance ticket) is valid for a maximum of four stops with tram or bus within the city of Leipzig (zone 110) without interchange option or for a maximum of one stop with the S-Bahn (fee 1.80 EUR). "Einzelfahrkarte - 1 Zone Stadt Leipzig" (full single ticket for 1 zone city of Leipzig) is valid for 1 hour for travel within the city of Leipzig (zone 110) with the option to interchange to any other tram, bus, and S-Bahn lines (fee 2.60 EUR). There also options for day or week tickets which are also distance-based. Tickets are bought at ticket machines located on most platforms and in some trams (not S-Bahn!) as well as directly from bus drivers. The machines accept cash. Tickets have to be validated prior travelling using the stamping machines located on the platforms (S-Bahn) or inside the vehicle (trams and buses). General information on Leipzig's public transportation system, timetables, and a connection planner can be found at www.lvb.de. There, you also find network maps for day and night. One word of warning to avoid confusion: DB (Deutsche Bahn) also operates regional and inter-city rail trains (IC and ICE) which are not included in the MDV local public transport association. These trains have a separate ticket system. DB ticket machines offer both, MDV tickets and DB tickets. So be careful what you choose when using DB machines. LVB and MDV ticket machines, on the other hand, offer MDV tickets only. You can by tickets at the ticket machine on the platform. For S-Bahn, RE, or RB trains, you by a light rail ticket (called "MDV ticket" for 3 zones, 4.40 EUR) which has to be validated by yourself at the stamping machine on the platform before entering the train. There are two stops, one at the big exhibition hall ("Neuwiederitzsch / Neue Messe") and the other (yours!) in the city center at the main train station ("Leipzig Hbf - Hauptbahnhof"), which will be reached after approximately 15 min. Outside the main train station of Leipzig ("Leipzig Hbf - Hauptbahnhof"), there is a major tram stop. Since you will travel less than five stops, you can buy a "short distance ticket" ("Kurzstrecken-Fahrkarte", 1.80 EUR) at an automat on the platform. If you already arrived via airplane and took a S-Bahn, RE, or RB train to the main train station, your "MDV ticket" is also valid for changing to the tram (within a time frame of 2 hours). In this case, you do not need to buy a separate ticket. Church and the book tower and new building of the German National Library. After your arrival at the German National Library, use the map on the Location page for your oriantation to find the "Max Planck Centre for Evolutionary Anthropology" and the "Center for Biotechnology and Biomedicine (BBZ)" where the conference is to take place. You can reach Leipzig by car via autobahn A9 (Berlin - Nürnberg) or A14 (Halle - Dresden), see map below. In case you are on A9 coming either from north or south to the interchange "Schkeudizer Kreuz", change to A14 in direction Dresden. Leave the autobahn at the exit "Leipzig-Mitte". Follow the B2 in direction to the "Alte Messe" (old trade fairground) and "Deutsche Bücherei" (German National Library) at "Deutscher Platz". You may look up the conference location directly in Google Maps to get detailed directions. There is the possiblity of parking at Deutscher Platz. Please let us know, we will be glad to make a reservation for you. Map of Leipzig and its neighborhood showing the autobahn network (in red) around the city and Leipzig-Halle airport at the upper-left. 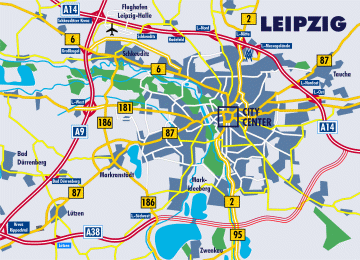 The city center of Leipzig is marked by the rectangle in the middle of the map.